The recent death of Clarissa Dickson Wright, the surviving member of the Two Fat Ladies TV cooking duo, leads me to review their fun, cholesterol-rich legacy. I was saddened last week to read of the death of Clarissa Dickson Wright, the TV cook and food writer, who along with the late great Jennifer Paterson, formed The Two Fat Ladies – one of the strangest and most distinctively English cookery double acts to come out of this soggy, pudding obsessed island. It’s difficult now to appreciate the impact that the Two Fat Ladies had on popular culture in the mid 1990s. At the time, the worried Western World was still clinging to the “fat is bad” mantra that had hung around since the great cholesterol scares of the 1980s. As medicos advised that saturated fat was the enemy and warned that everyone’s cholesterol was dangerously high, out went the butter and cream and in came margarine, skimmed milk and mung beans with everything. Foods once rich in fat were repackaged in low fat incarnations (usually with the helpings of sugar and artificial flavourings racheted up to help with the taste). Red meat became illegal overnight, and suddenly everyone was dutifully peeling the skin off chicken breasts and getting excited about things like tofu. 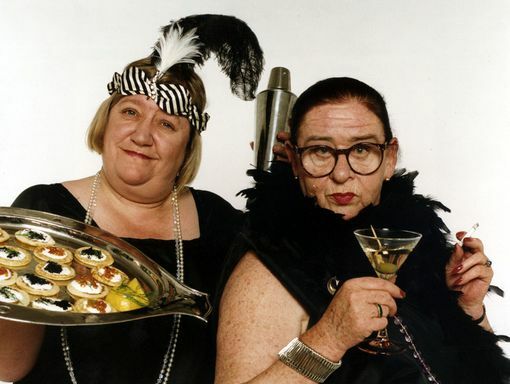 Into this anxious haze came The Two Fat Ladies: large of personality, corpulent of frame, gleefully un-politically correct and unashamed advocates of “traditional” English food, rich in butter, cream, red meat and alcohol. Each week Jennifer would crank up an antique motorcycle (with Clarissa good-naturedly squeezed into a sidecar), and head to a country location to cook a meal for one of the lost tribes of middle England: girls’ school lacrosse teams, polo clubs, grizzled motorcycle enthusiasts, country cricketers, troops of Ghurkas, Welsh male voice choirs, rosy-cheeked rowers from Cambridge, nuns and the occasional lumberjack. In each episode, the pair would go on a food scavenging hunt to a local butchery, fishing boat, farm or vegetable garden, where they’d secure fresh, seasonal and locally-sourced produce. Like all TV personalities, the Ladies’ image was artfully constructed. Though they appeared to be old friends, they’d never met until their producer introduced them before making the pilot episode. While Jennifer was a keen motorcyclist, the antique bike-with-sidecar they rode was another flourish of BBC’s art direction. And the “impromptu” visits to farms and the like were, of course, carefully pre-planned, if sometimes clunkily executed by the local farming folk who didn’t quite know how to play along with the facade. Otherwise, the pair seemed to be left alone, with a minimum of editorial intervention. And therein, I think, lay the secret appeal of the show – older women who were happily, eccentrically and unapologetically themselves, having a ball in the kitchen. Neither worried particularly about how they looked. Jennifer wore lipstick with matching fingernails painted in fire engine red (more about them later), and Clarissa occasionally wore pearls, but otherwise each dressed as if they’d just wandered in from a day in the garden, in loose fitting trousers and sensible shoes. Clarissa wore tent-like shirts emblazoned with scary fruit motifs, while Jennifer preferred salwar kameez-type shirt coats that often revealed a layer of quivering back fat. They resembled the slightly scary dinner ladies of a comprehensive school, or two favourite maiden aunts who made liberal use of the gin bottle at Christmas – a world away from the sleek air-brushed and tiresomely sexualised persona of Nigella Lawson, Britain’s celebrity chef of the Naughties. After each meal, the two would recline in front of a picturesque view, reflecting on the fun of the day – Jennifer with an enormous G&T and a cigarette in hand, while teetotaller Clarissa nursed a glass of what looked like water. When I first watched Clarissa and Jennifer, I was reminded of the wonderful American TV chef Julia Child – a similarly larger–than-life character who arrived on TV fully formed and without the ministrations of a PR expert or focus groups to pre-determine her popular appeal. Though their food wasn’t to everyone’s taste, the Two Fat Ladies themselves became hugely loved, largely for being themselves. TFL‘s producers were clearly aware of the shock value created by seeing close ups of butter being spread thickly on crusty bread or entire jugs of double cream being poured into simmering meat sauces. Clarissa and Jennifer played up to this taboo with pornographic zeal. Jennifer in particular raised a few eyebrows (and turned a few stomachs) by mixing food with her bare hands, red nail polish blazing, and all her rings left on. “They’re scrupulously clean, of course” she would say to the camera, tongue conspiratorially in cheek, as she plunged her hands into a chicken carcass. In reality, we suspected that they were covered in axle grease from the motorcycle, and probably some stray cigarette ash. There was something fascinating and slightly grotesque about it – as if a red-nailed witch from a children’s fairy story had been let loose in the kitchen. Their rule-breaking in cookery and unabashed nostalgia for the days of gin and tonics, the Raj and cooked puddings for tea proved, unsurprisingly, to be a huge hit in Britain. Rewatching the series over the weekend, it was slightly alarming to note how much each episode resembled Midsomer Murders or an Agatha Christie adaptation. Everyone was conspicuously white, village-dwelling and clinging to a fantasy of England as a rural idyll, rather than an industrialised nation where the majority of the population lives in cities. That being said, the pair cooked a surprising number of non-English recipes, with dishes drawn from Spain, Portugal, France, Sweden, and Jamaica (where they hosted a Christmas special in Series 4). Notably, they never cooked pasta, though I suspect that was as much to do with the BBC not wanting a conflict with its other culinary star, pasta-loving Jamie Oliver (with whom the Ladies shared a producer) as it was about the un-Englishness of pasta. There was the occasional exception to the rule, where the ladies motorbiked out of the countryside and into the city. In one especially fun episode, they catered a cocktail party at the Brazilian Embassy in central London, allowing Jennifer to practise her Portugese on the butler. Later, she and Clarissa headed to the bar at the Dorchester to learn how to mix caipirinhas. As Clarissa sat on a bar stool, reminiscing about the days when she used to drink there until she fell off her perch, Jennifer flirted outrageously with the barman, ending with the two of them erupting into song. It was a wonderful, surreal, joyous moment, better than any pre-scripted gag a TV comedian could ever manage. More surprisingly, they proved to be a huge hit internationally – especially in America, where audiences thrilled to the pair’s dual charms of Wodehouse-like eccentricity and liberal use of red meat and fat. When they appeared in Melbourne on an Australian tour, over 26,000 people turned out to see them. They made a strange, surprised pair of celebrities, appearing together on talk shows and selling hundreds and thousands of cookery books. The BBC commissioned four series – the last one sadly cut short when Jennifer was diagnosed with lung cancer. Prince Charles, who was apparently a fan (despite their saying rather rude things about his mistress in one episode), sent organic tomato soup and caviar to Jennifer’s bedside. Sadly it didn’t help, and she died a month later, aged 71. It’s notable that she died of lung cancer, not high cholesterol, suggesting that her love of butter, double cream and gin wasn’t all bad. Ever the trouper, Clarissa soldiered on alone, making several TV series exploring her love of traditional English food. In 2011, she published a well-regarded book, A History of English Food, a fascinating, highly entertaining romp through eight hundred years of English eating habits. I bought it last week, intending to give it to a friend, and promptly gorged my way through it as if I was at one of the Ladies’ high-fat high-carb banquets. Like all good food writers (and historians), Clarissa has strong opinions and isn’t afraid to express them, and develops a few interesting theories of her own about the genesis of certain foods. Lent, she argues, was as much about the need to preserve livestock during spring breeding season as it was about religious pieties, and the mighty Portugese custard tart may have been an English recipe later taken back to Portugal by Charles II’s widow, Catherine of Braganza. Things go mostly downhill after the 18th century. Clarissa turns up her nose at the Victorians, who she blames for starting the English trend for processed foods and over-boiling vegetables. She praises the Ministry of Food for their efforts in keeping the nation well-fed and healthy during WWII. Her take on contemporary eating habits is approached somewhat more cautiously than you’d expect, given her and Jennifer’s criticism of so many modern affectations: “It’s virtually impossible to spot trends when you’re living through them”, she says, although she has a fairly good go. There’s the expected admonishing tut-tutting about modern dieting fads, nutrient-free processed foods and the horrors of fast food culture. There’s also quite a lot of praise for the variety and quality of foods on offer, the resurgance in restaurant dining as an established part of English life, and the burgeoning “local food” culture, exemplified by farmers’ markets. I was tickled to read that Borough Market, one of my favourite places in London, was officially opened by the Ladies, who marked the occasion by milking a goat. A History of English Food is the book that Clarissa was clearly born to write. It’s a lovely record of the creativity and historical food knowledge that Ladies brought to their television show, and just such great fun to read. It’s been quite a while since I’ve read any non-fiction work that’s entertained me as much as this one. I highly recommend it to any foodie or history geek. It’s notable that since the Two Fat Ladies have been and gone, food fashion has gone full circle. Their once-controversial diet of red meat, fat and dairy is now the cornerstone of the modish Atkins and Paleo diets. Their liberal use of fresh herbs in cooking has found favour with nutritionists and naturopaths (well, some of them), and their preference for fresh, locally sourced and organically-grown food seems perfectly synched with today’s Guardian-reading eco-warriors. There’s such a delicious irony to it all – it’s just a shame that Jennifer and Clarissa are no longer around to cackle wickedly at the joke. I’m seldom a fan of nostalgia and often wish that the solipsistic English would leave behind the comforting fantasies of their not-quite-so-idyllic past. That being said, I cherish the Two Fat Ladies as a remarkable example of eccentric, un-airbrushed old school Englishness. By resisting the fashionability of the modern age and sticking to their authentic lard-smeared selves, they earned our respect and our affection. In every show, they conveyed the huge sense of joy they got from cooking and the importance of good food as an essential part of a good life. In doing so, they made food – and life – just a little bit more fun for the rest of us.